Upcycled furniture and vintage market is coming to Kensington. Stop by and get inspired! 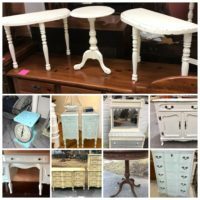 Browse our selection of solid wood vintage furniture, creatively refinished and upcycled pieces, a fantastic collection of transferware glass, milk glass, Pyrex, retro and vintage home decor, unique finds and art. Visit our DIY Transformation Station to pick up materials and ideas for your own DIY projects. We are looking forward to seeing our old friends and new fans at 10805 Connecticut Ave., Ste B, Kensington, MD 20895. Hello Matrice, please reach out to the market directly. We list the markets only. Good luck! I’m looking for Spokane, WA. and all the dates are old. Just a suggestion; delete old Markets/Shows.